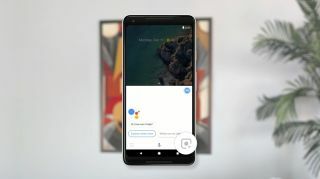 We've been impressed with Google Lens ever since we first heard about it in May, calling it a "game changer" and reporting that it's blowing our minds even though it's not even out yet. It finally started showing up on Google Photos in Pixel units last month, and this week Google announced in a blog post that Lens will be coming to both the Pixel and Pixel 2 phones in the coming weeks as a built-in feature for Google Assistant. Just pull up Assistant like normal, and you'll see it in the lower right-hand corner. For the uninitiated, Google Lens lets you use your Pixel's camera to learn and record information about whatever it is you're looking at. That means you could aim it at the Statue of Library and pull up some articles about it, or you could point it at a book cover and pull up an interface that will let you buy it. You can also save information from business cards or open URLs you see on posters. At its simplest, it acts as a barcode or QR scanner. That's currently about all Lens does, but Google's presentation at I/O last spring showed the company had some much wilder plans for the tech, such as a feature that would remove, say, a chain-link fence blocking the view of a baseball player at bat. That currently sounds a little too good to be true, even with the impressive list of other features, but we're excited to see if Google can pull it off. No doubt the service will only get better with time. The feature is currently limited to Pixel phones for the time being, and the initial rollout will be limited to "Pixel phones set to English in the US, UK, Australia, Canada, India and Singapore."